The ODI series having been successfully bagged and the prospect of regaining the Ashes looming large, the T20 series kicked off at Chelmsford. For some time this has been one of the most successful, if not the most successful, venues for the international women's game. Crowds here have always turned out in excellent numbers, frequently in the 3,000s. This time, however, was to take everyone by surprise! Firstly there was no men's match being played on the same afternoon/evening. This was to be a stand-alone evening match under the lights, and so a smaller crowd might have been anticipated. But it was not to be, and the ground sold out with a crowd in the 5,000s. I don't believe a County Ground has ever sold out a women's-only match before! I left the camera behind, partly because photographing under lights does not produce the best photographs with my kit but also because I had arranged to meet a friend who, while he has watched one or two women's matches before, could not be said to be a 'regular'. Neither side disappointed. Sarah Taylor played the kind of innings one always hopes to watch - elegant as ever with her 77 from 58 balls - and while England made 146 for 4 some wondered if that was enough. Australia stuttered and it seemed early in their innings that England had this in the bag, but Australia's middle order gave England something of a fright, fighting back resolutely, with Perry and Haynes in particular playing T20 innings of real verve. My friend travelled home pronouncing he had thoroughly enjoyed the match. The second T20 was played at the Rosebowl in Southampton. Yes - I know this now is supposed to have another name paid for by a sponsor but spectators and commentators alike seem unable, like me, to think of it as anything other than the Rosebowl, and while we all appreciate the money that Ageas must have put into the game they do seem to be fighting a losing battle. The crowd built up slowly here during the game, although I was somewhat puzzled by people arriving just 10 or 20 minutes before the end of the women's game but with considerable time to wait before the men's started. Not for the first time Meg Lanning starred for Australia. Better than a run-a-ball 60 comprised in the end almost half the Australian total. With just 127 to chase, England must have felt reasonably confident. This time it was England who stuttered and at 9 for 3, 128 looked a long way away. 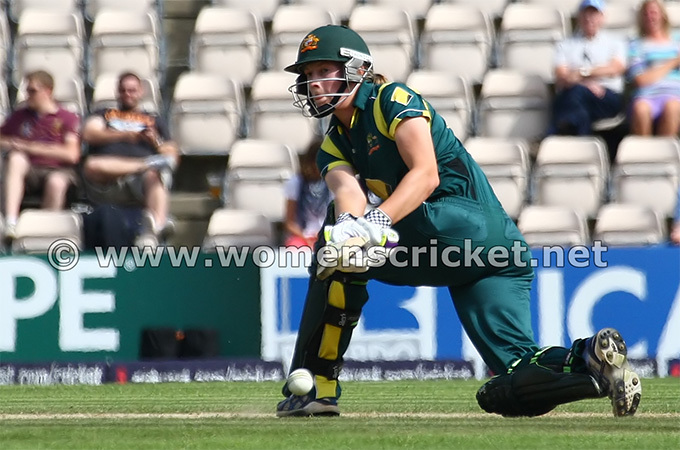 This time Lydia Greenway came to the rescue and her mixture of sweeps, drives and reverse sweeps brought her 80 off just 64 balls and produced an Ashes winning knock. England celebrated by signing an appreciable number of autographs and posed for photographs by friends, family and supporters. While Heather Knight, later to be named 'Player of the Series' signs autographs. Heather Knight signs bats, caps and shirts. Many in the crowd were disappointed that a lap of honour did not materialise, and that, England having regained the Ashes, no presentation occurred. Both were saved to follow the last T20 at Chester-le-Street. Lydia Greenway did receive a Player of the Match Award. It must been the easiest choice the adjudicators have ever had to make! Chester-le-Street is a considerable distance from my home in the south and so I gratefully accepted Sky TV coverage of this match. Somehow, losing the Ashes seemed to knock the stuffing out of Australia. Once again Lanning made the major contribution (how often have I typed that name!) and despite the fact the track did not look as easy as some earlier ones had done, a score that failed to reach three figures never seemed enough and England knocked it off with almost four overs to spare. That didn't stop England once again losing three wickets in next to no time, being at one time 14 for 3. Lydia Greenway carried on from where she left off and Nat Sciver produced her highest score to date. The celebrations finally followed this match with a severely injured Heather Knight being towed around the ground on a trolley kindly provided by a quick-witted Katherine Brunt who spotted it close to the boundary. The end of the series did though provide England supporters with some worries. A series against New Zealand and West Indies looms and injuries mount. The squad has now been chosen and many familiar faces are missing including the fast bowling trio of Brunt, Elwiss and Shrubsole. England's pace attack will look very different in Barbados and Trinidad. That all three should be injured at the same time suggests that not all is well with the training and playing set-up currently. It is tempting to think that maybe the regime in place many years ago may have something to recommend it. What was that? Well - train less and play more. However, the fashion in the men's and women's game has changed and it's unlikely that the 'play-more, train-less' philosophy will be adopted. It seems to me that slightly less fit players playing is preferable to injured, highly fit ones, not playing.